Weatherseal Roofing Ltd - Fascia/Soffits/Guttering, Roofer, Windows/Doors/Conservatories based in Worthing, West Sussex. 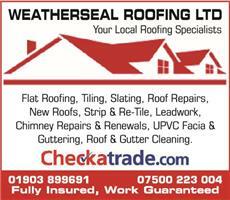 Weatherseal Roofing Ltd, your local Roofing specialist. We offer a complete roofing service, from a missing tile to a complete new roof. Call us for a free no obligation quote or even just some friendly advice.